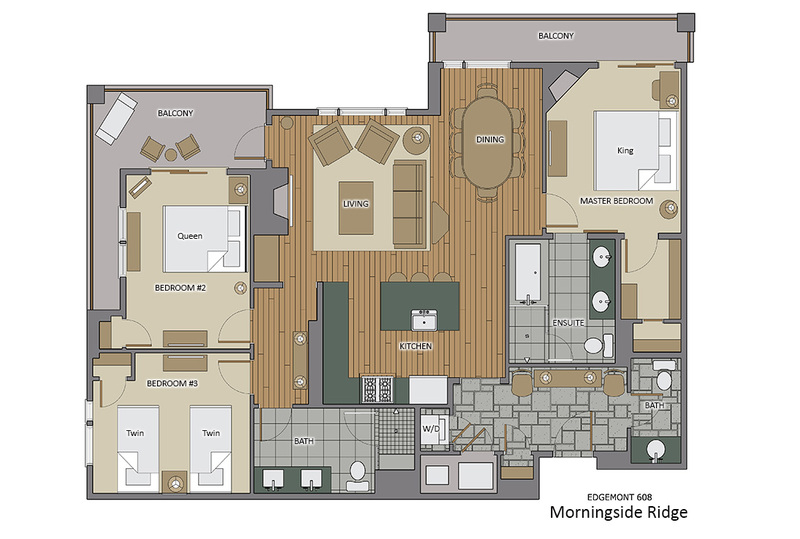 Morningside Ridge is a spectacular 3-bedroom residence at Edgemont. This exclusive slopeside property is located right on Steamboat Ski Area's Stampede ski run close to the Steamboat mountain village. Edgemont is one of Steamboat's most recent luxury additions. Its location, literally on the slopes of the Steamboat ski area, places it just above the base area village. The Morningside Ridge Residence has panoramic views from the Flattops Range to the south and all the way to Sand Mountain to the northwest with the gondola passing by in the foreground. When you aren’t on one of the balconies enjoying the view, you can relax in the open style living room. There is plenty of space to spread out and enjoy each other’s company. The natural rock gas fireplace creates a warm focus and gathering place while unwinding after a day of adventures on the mountain. The fully equipped professional kitchen will inspire you to cook like a Michelin Star chef. The 6-burner Viking Range and GE Monogram appliances are complimented by the custom cabinetry and stone countertops. There is seating for 8 at the dining room table and an additional 4 at the kitchen bar so entertaining a larger group is also easy. The interior design of this delightful three bedroom residence is both warm and inviting with a modern-mountain feel. The master bedroom has a King bed with a gas fireplace. There is also a private balcony, walk in closet and beautiful ensuite bathroom. The second bedroom offers a Queen bed with balcony access. The third bedroom offers two twin beds. These rooms share a bathroom with two sinks and a large shower. Beyond this spacious residence guests can enjoy Edgemont's community amenities; such as: the spectacular heated outdoor pool and hot tub, enjoy a conversation over s'mores and hot chocolate by the outdoor fire pit, or relax in the indoor community lounge next to the gas fireplace. Getting on and off the slopes couldn’t be easier with ski lockers located next to the slopes. On request winter shuttle service makes for easy access to everything locally and avoids the need for renting a car. Perfect condo, perfect location and perfect management company. Thank you!! Building and condo were perfect. Great location, just as pictured, everything new and in working order. Moving Mountains was very helpful and responsive. Amazing place! Stayed here with my wife and three young children. The Unit had everything you could need and the layout was perfect for our family. The building and unit were spotless and the location was convenient for skiing and getting around town. We will definitely stay here again. Luxe meets Location. Top Notch. Shhhhh. Not too loud. This place is a gem. We have been going every year since 2014 in winter and fall. Great views. Beautifully furnished and well appointed with comfy beds and high quality linens, super kitchen and large luxury baths. Ample room and great layout. You just can't beat the shared amenities and location. True ski-in ski-out with slope-side locker room complete with boot dryers. Huge heated pool, outdoor spa, and pool locker room with towel service, fire pit, library, and a small gym. Close to town amenities. Now we're spoiled. Really.